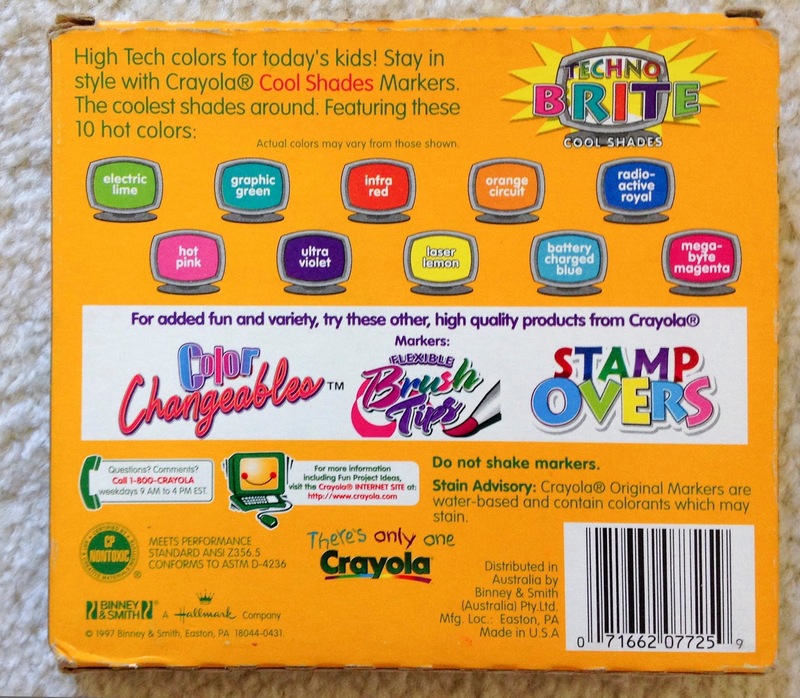 The Crayola Techno Brite Crayons box came out in 1997. It is very similar the Hot Fluorescent box that came out years earlier, but the names are all centered around technology. On the back it says, "Try these bright high-tech colors for all your high resolution graphics!! (and your pictures too!). 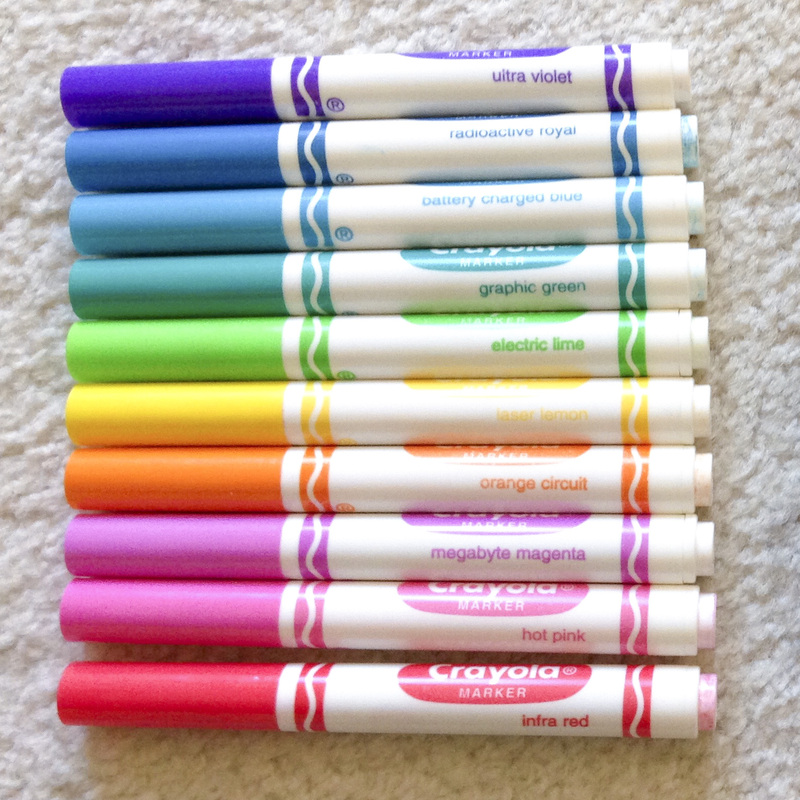 The crayon names are so funny, floppy yellow, point & click green, www.purple. They came out when computers were starting to play a major part in everyone's lives, not quite their daily lives yet. I think we had internet, but it was the super slow aol.com. It would take forever to load and would say "You've Got Mail" when you signed in. Click here to search for these on Click here to search for these on eBay, may or may not be available. Techno Brite marker pictures in this post by Stacey Hodges. 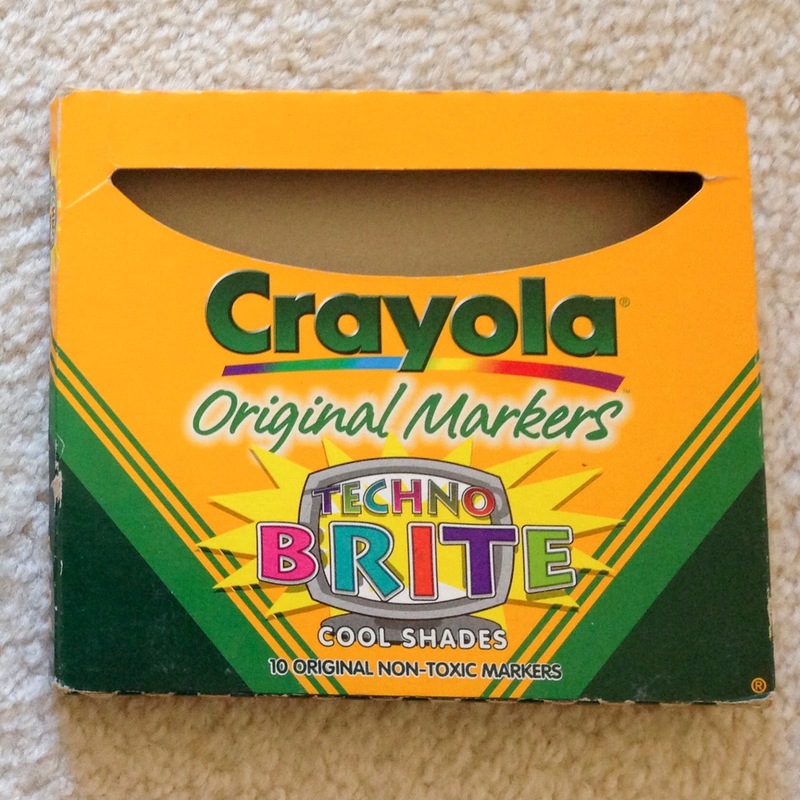 Crayola also came out with a box of Techno Brite markers. Crayola likes to make boxes of matching crayons and markers. The main difference with the markers is they were called Cool Shades after Techno Brite. The colors contained in the box would later be used for another box of markers. I am unsure what the box is called at the moment, but will research it. These two boxes were introduced in 1997. I think they were introduced to promote the new Crayola website. The website was developed in late 1996. All the boxes made in 1997 included the text, "For more information including Fun Project Ideas, visit the Crayola INTERNET site at: http://crayola.com". It is so interesting they made the text in red and they also called it INTERNET instead of website and included the http:// instead of www. I never bought the Crayola Techno Brite crayons when I was a kid. I was in high school by that point and probably worried about high school things. And I did not have a lot of money. I wish I would have bought them though and so many more boxes. There are some truly great boxes that came out around that time. Crayola was experimenting a lot with of different effects with crayons. I picked up this Canada box from a fellow collector who is selling his entire collection. I wish I had the money and the room to buy his whole collection. Both of these boxes are very collectible and hard to find.